Think up the worst wedding disaster and you can be sure it’s happened in the history of the world. Not YouTube-viral blunders, but the more pedestrian disasters that happen to fall on a very special day. Bridal emergency kits are a thing of beauty that you can purchase for a nominal fee. However, you can always make your own! Start out with a sturdy but pretty wicker basket and add your items. Or go for a reusable tote like the Picnic Time Anthology Collection Market Basket collapsible tote. 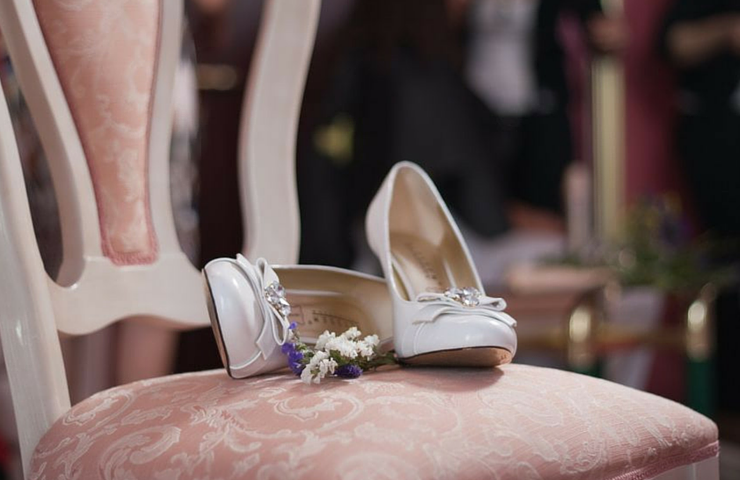 Think of the worst that can happen to a bride on her big day: a torn dress, a broken shoe strap or a disastrous stain. There’s a fix for everything! Heavy-duty double-sided tape, safety pins and a small sewing kit can repair a wayward hem, a broken heel or a split seam. A lint roller and clothing steamer, like this Conair GS23 handheld model, can also be wedding dress lifesavers. You will need these: pressed powder or oil-blotting papers, touch-up nail polish, industrial-strength hairspray and a good pair of tweezers. Don’t forget tissues. Lots of tissues. A small toothbrush, travel-sized paste, mints and antacid tablets will help with a sour stomach. Eye drops for redness or dry-eye are a good idea, too. Her makeup will likely be done, but good brushes are essential for touch-ups. Try the Bare Escentuals bareMinerals Brush Collection. Bandages should be part of everyone’s everyday kit. Instead of visible patches, consider liquid bandage. Medical-grade superglue covers a shaving nick or a pin stick invisibly. It can also work for a broken fingernail in a pinch. Throw in an emery board and all-purpose scissors. And for those beautiful bridal shoes she tried on just once — give her extra insurance with a comfier spare pair for dancing. These Style&co. Mulan2 Embellished Evening Wedge Sandals are a Macy’s exclusive. Why is one of life’s happiest moments so filled with tension? Set a calm vibe before you step out on the white carpet with some spa music on this Polaroid LED Bluetooth speaker. Keep on hand a scented candle and Origins Peace of Mind® On-the-spot relief aromatherapy gel. All that time in hair and makeup, plus many more hours before the reception make a blood-sugar lift a necessity. Stash something energy-packed but not too crumbly and definitely nothing colorful or juicy. How about some green grapes and energy bars? Don’t forget bottled water with some straws — the better to preserve dress and lipstick! Don’t forget an extension cord and portable charger: power goes out and batteries run down. It’s also easy to forget something blue. How about slipping a glass charm onto a bracelet or anklet? Easier: tuck a bottle of Essie Bikini So Teeny polish and stripe the bottom of her shoe — or paint a single nail. Finally, sunscreen is a must at an outdoor wedding. Shiseido Urban Environment Oil-Free UV Protector SPF 42 is light yet protective. Whether she’s planning a big bash or an intimate gathering, it’s your big day. Don’t take chances! Save yourself run-around time: Buy online and ship to a Macy’s near you for free pickup, or enjoy free shipping to your home when you spend $25 or more.